It all started when i saw a random person with a bright yellow shoe and my craze escalated ten fold. You would probably realised that i am only coveting bottoms or accessories. Yellow has never looked good on me. So this craze will either be a win or a disaster. I am over the mustard season but i am happily in love with bright almost neon yellow. 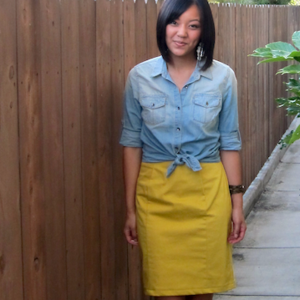 I adore how the yellow shoes instantly brightens up the whole look! I found one at a store the other day but they don't have it in my size and i am determined to get it. Even if i have to squeeze my toes in! And i am secretly wishing no one else is on this boat with me! Hehe. Go like other colours and let me enjoy yellow for the moment for i am sure this craze won't last. Hehe. So you know what I will be looking for this weekend! Hopefully i get back home with rays of sunshine in my shopping bag.